We’re talking about one of the marketing plans that fits nicely into small marketing budgets for real estate professionals and realtors. We’ve found that the best practice in using door hangers is to farm a specific area. This allows you to test your marketing in a specific place to test the results of door hanger marketing. With the Short or Stay marketing system, you can place your Short or Stay Calculator on a specific domain and then market that domain on your door hangers to track the results. It’s also important to put your information and branding in front of homeowners. Understand that people share information with others and might pass on your information to those other people. One idea to offset costs is to team up with a mortgage company or a title company. If you can market with a partner, the cost can be split. Training other agents is a great way to generate leads. The benefits of training other agents are numerous. First, you can solidify your position as an expert in your area. Secondly, training other agents creates a referral source from other agents. And lastly, this promotes an environment of abundance and a relationship in your market. Promote the idea that there is enough business for everybody. When you’re considering this option, set a time, date, and location and follow this up by sending out a notice to agents in your office and area. Consider promoting this training with your local NAR. You don’t need to cover your lead generation process. And ALWAYS remember to end your training by asking for referrals. At a later time, you can consider providing paid training service. Today, we’ll continue our conversation about free marketing plans with a creative idea, hosting a live open forum. This forum can be a small seminar, large seminar, or town hall setting. The type or size of your forum isn’t necessarily important. It’s important that you understand the benefits of a live open forum. Firts, you’re given the opportunity to be face-to-face with potential clients, answering their questions and concerns. Secondly, this platform gives you the advantage of being seen as the expert in your field. And lastly, with most businesses, it is easier to close a deal when you are face-to-face with your potential clients. To set up a live open forum, there are a number of steps that need to be completed. Set up a time, date, and location for your marketing efforts. Through your information process, let prospective clients what you will be talking about, then tell them and follow that up by telling them what you’ve just told them. Finally, remember to finish up with a call to action. Give them direction as to what you would like them to do next. It allows the visitor to “get to know you” – this is critical, because real estate is such a relationship business. It gives Google content via the text you post on your website and the video you post on YouTube. There are multiple ways to enhance your vidoe blogging efforts. Creating a few good habits from the list below will generate positive results both in the short term and long term. Keep your videos short. Each video should be under 3 minutes with 2 minutes as your goal. Connect with the viewer – the goal is to get each viewer to identify with you and reach that moment where they say “This video is relevant to me!” For example, “I help homeowners in Northern California avoid foreclosure” or “I sell muffler belts for 1986 Camaros” Whatever your niche is, we want the viewer to realize immediately that this video is for them. Display your expertise – inevitably, you know more about your product/service than somebody searching for your product/service. Let them know that you are the expert they are looking for. Give the viewer a reason to choose you or your product/service. Call to action – Tell the viewer what to do next. The average web surfer is only looking for what they can click on next. So, TELL THEM what to click on next. Make several videos at a time… It saves you time! Block out 1 hour a week and you can make and post as many as 5 videos. Repeat! A visitor that is on your website today, wasn’t there 3 months ago; so it doesn’t hurt to talk about major topics once a quarter. Plus, you now have more videos on the same topic helping you to dominate that search term. Put your call-to-action into your YouTube description. That is, start your YouTube descriptions with “http://yourdomain.com” – make sure to include the “http://” part as that tells YouTube you want a link and not just text. This puts viewers one click away from your lead capture page. And finally, remember that while you want thousands of people to see your video, you’re still talking to just ONE potential customer. It is imparative on your Short Or Stay (SoS) website that you track where your visitors are coming from. Using this knowledge you can focus your marketing dollars. Here are the steps to add Google Analytics to your SoS website. 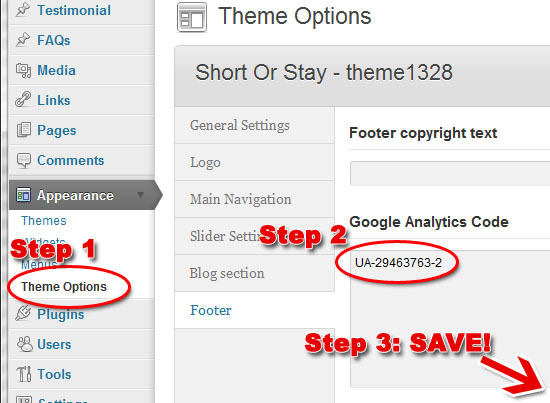 Under Appearance -> Theme Options -> Footer -> Google Analytics Code inpurt your “UA” number provided by Google. Login to the back of your website with your personal username and password. When you have successfully logged in, you will see a menu along the left side of the screen. Scroll to the bottom of that left side menu and click on the menu option that says “Short Or Stay”. This should take you to a screen that shows your Zillow API key, name, email address, etc. Scroll about half way down the page and you will notice three drop down menus that allow you to adjust the slow, average, and aggressive appreciation percentages. When you have changed the % to better reflect your market, please remember to click the blue “SAVE CHANGES” button at the bottom of the page. After making changes, you may want to retest your calculator with a few examples to see you are getting the desired results. Can I Put the SoS Calc on My Site? Yes, you can put your SoS Calc form on other websites. This is done using the IFRAME HTML tag. Depending on your website set-up you may need to get your current webmaster to assist you. Or, post your question below and our staff will help out. NOTE: change mysosdomain with your domain name. In the above code there are options that you can tweak to change how the form looks. Notice in the code type=wide. This code can be changed to type=narrow, and the video will display over the form instead of next it. But, these can be tweaked depending on your website’s design. The width of the video can be changed by changing the value of width=558. This is handy when you want to use the wide type option, but it is just a little too wide. You can shrink down the width by shrinking down the video size. The scheme setting changes the color of the text. If you have a white background then you would want black text, and if you background is dark – you would want white text. To change the text color simply change the scheme=black setting to either: black or white. https://directbusinessmarketing.com/wp-content/uploads/2016/02/DBM-logo_horizontal_white_100x275.png 0 0 Webmaster https://directbusinessmarketing.com/wp-content/uploads/2016/02/DBM-logo_horizontal_white_100x275.png Webmaster2012-01-26 14:05:552012-08-02 16:44:13Can I Put the SoS Calc on My Site?